Of the more than 60 thousand meteorites known to date, about two hundred flew to our planet from Mars. 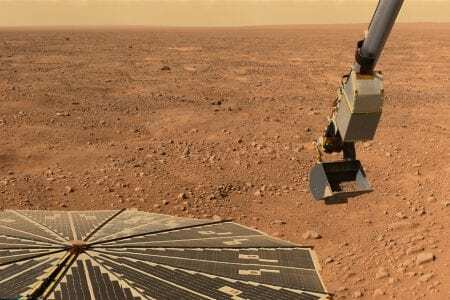 It was possible to establish the exact “departure station” by comparing the isotopic and elemental composition of meteorites with the data obtained by the rovers directly on the red planet. However, researchers were extremely interested not only in where the meteorites came from, but also in what they brought with them, and it was here that the main issues lurked. It turned out that organic substances are present in the composition of Martian meteorites, an analogue of which on Earth is kerogen, a complex mixture of polymeric organic compounds found in sedimentary rocks. The resulting layers acted as electrodes, and in the space between them, carbon dioxide could be converted into organic matter. The first hypothesis put forward was that the organic phase in Martian meteorites is of terrestrial origin: nevertheless, meteorites arrive from other planets that are not hermetically packed and can easily pick up different organics upon arrival on Earth. But if for meteorites that have lain in the earth for more than one thousand years, as is the case with the ALH84001 meteorite found in Antarctica, this could also serve as an explanation, then for very fresh cosmic bodies with organic matter on board, such arguments sound unconvincing. Having decided that organic matter is still of Martian origin, the researchers began to put forward various hypotheses from where it could appear. Naturally, the most tempting of the versions is the biogenic origin of organic matter. However, in the case of meteoritic organics, such a hypothesis did not find substantiated confirmation: the results of various studies rather indicated non-biological origin. But how exactly Mars organic was formed still remains an unresolved issue. Recently, researchers from the Carnegie Institute and a number of other scientific organizations published a paper in which they proposed an electrochemical hypothesis for the formation of organic substances on Mars. The subject of study was the spatial location of the organic phase and the composition of minerals in three Martian meteorites. It turned out that organic inclusions are adjacent to crystals of such minerals as titanium-magnetite, pyrrhotite and pyrite, and they contain areas with a high content of oxidized iron. This means that there could be an electrochemical reaction. It is possible to draw an analogy with the way iron corrodes in seawater, but instead of oxidizing iron with oxygen, the molecules of dissolved carbon dioxide are reduced to simple organic compounds. The key point here is a very close location of the faces of the minerals, which act as micro electrodes. When a liquid electrolyte enters the space between the minerals, an electrochemical reaction begins and a very high electric field can be formed between the micro electrodes. Under these conditions, various chemical reactions can occur that are not possible under normal conditions. Such mineral “batteries” could act as natural converters of carbon dioxide into a wide variety of organic molecules. The discovery of such mechanisms can broaden our understanding of how chemical “building blocks” that are necessary for the origin of life can be formed. By the way, a process that effectively converts carbon dioxide into organic matter, for example, using sunlight, could be very useful on Earth to fight the impending global warming.